(17/P62) TRENTON – The rolling fields and woodlands of Monmouth Battlefield State Park will once again reverberate with the rattle of musket fire and roar of cannons as General Washington’s Continental Army clashes with British redcoats and their allies during the annual reenactment of the Revolutionary War’s Battle of Monmouth this weekend. 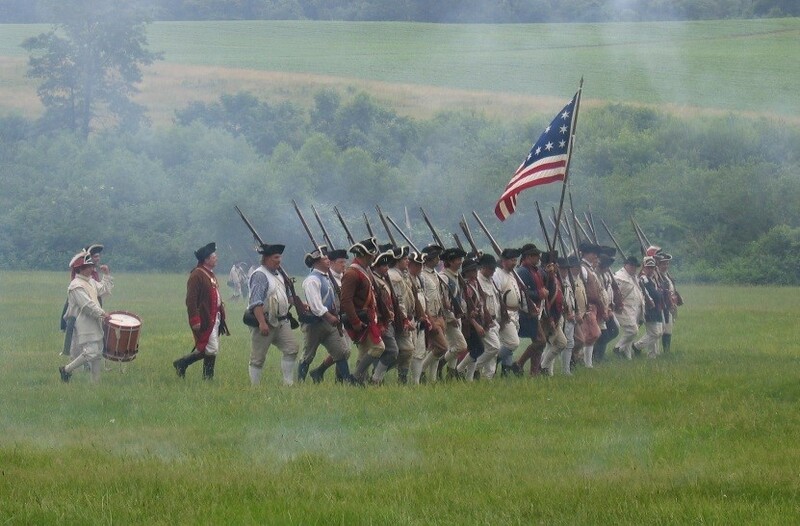 The reenactment, taking place Saturday and Sunday at Monmouth Battlefield State Park, recalls the June 28, 1778 battle that historians consider to be a tactical draw but a strategic and morale-building turning point in the War of Independence. The reenactment weekend is one of the largest living-history event in the state. Encampments will open to the public at 9:30 a.m. both days, with the battle reenactments scheduled for the afternoons on both days. Events will conclude at 3:30 p.m. on Saturday and 3 p.m. on Sunday. A $10 per vehicle parking donation is requested to help defray costs. The reenactment weekend is co-sponsored by Friends of Monmouth Battlefield and the DEP’s Division of Parks and Forestry. The story of Molly Pitcher, the legendary heroine of the battle, will be told each day. Pitcher, whose real name is believed to have been Mary Ludwig Hays McCauley, reportedly loaded cannons and carried pitchers of water to aid soldiers, leading to her sobriquet. 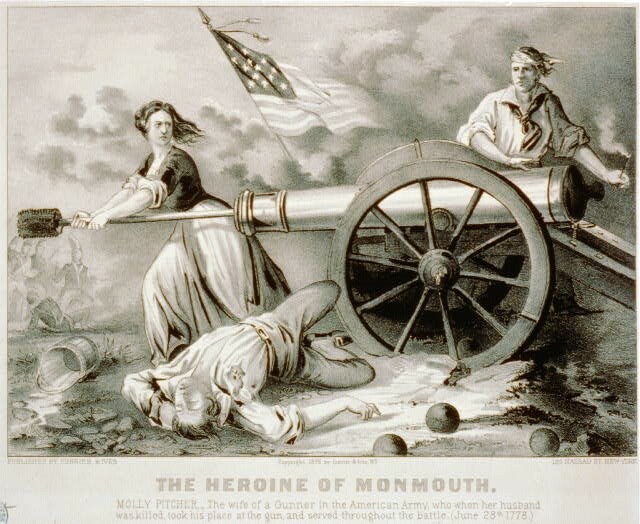 Legend holds that Molly Pitcher took her husband’s place in a cannon crew after he either collapsed or was wounded. The 3,000-acre park is located at 16 Business Route 33 in Manalapan, Monmouth County, 12 miles east of exit 8 of the New Jersey Turnpike. The battle took place when Washington’s army intercepted British, German and Loyalist soldiers fleeing from Philadelphia to New York to escape an impending blockade of the Delaware River by a French fleet. Although the British-led troops slipped away under the cover of night, the battle occurred at a time when the Continental Army was low on ammunition and had spent a brutal winter at Valley Forge. The battle was marked by leadership mistakes on both sides. Visitors will be able to view reenactors portraying enlisted men engaged in cleaning their weapons and other camp activities as well as the women who cooked, mended and washed clothes in camp. They will also encounter soldiers drilling and artillerists demonstrating the steps needed to load and fire a cannon. Other highlights include formations and marches by the British and Continental armies, and a wooden-musket drill for children. Monmouth Battlefield State Park is home to an award-winning visitor center that opened in 2013. The 13,000-square-foot facility includes windows framing a panoramic view of the rolling farmland upon which the Battle of Monmouth unfolded on an oppressively hot early-summer day. Fascinating and engaging exhibits track the battle’s progression, and are complemented by park interpretive specialists who bring the battle to life. The battlefield is the setting for two working farms, one that grows corn and soybeans and another that offers pick-your-own produce – strawberries in the spring; cherries, peaches and nectarines in the summer; apples in the late summer and early fall; and pumpkins in October. For questions about reenactment activities in case of inclement weather, please call the Monmouth Battlefield State Park Office at (732) 462-9616.